Miguel has been searching for his Little girl for a long time. Could the bedraggled young lady living in the alley next to his hotel be his perfect match? “Roxy?” He turned to the young woman who had scrambled to her feet. She held the thick piece of cardboard in one hand and the bag of stale, withered sandwiches in the other. The waif caught his attention. She was about average height with black hair in windblown braids that draped over each shoulder to extend over her breasts. She was dressed in a grey hoodie with faded jeans and dirty sneakers. Her dark brown eyes lifted honestly to meet his. “Mr. Herrera, I was not trying to cause any problems.” She held the bag of sandwiches out to him as she tried to disguise the longing on her face. She was so hungry. Jim’s job was more important than her stomach. She’d learned a lot about this former special ops soldier over their lunches - not military stuff, but the important things. Jim was kind and loved his fiancée with all his heart. Becky was from his hometown. He’d left the military because he knew Becky worried about him. They were getting married next month. Roxy had been invited, but she knew she wouldn’t be able to attend. She didn’t have any clothes appropriate to attend the church service. When he didn’t take the bag from her hand, Roxy bent to set it at his feet as she prepared to back away. She’d go further into the dark alley for a while to disappear from view. She tried to stay near the entrance because there was more light and she could escape onto the sidewalk if anyone bothered her. There were a few stray dogs that had growled at her aggressively the last time she’d been back there. Since then, she’d stayed up by the hotel. “Of course, you may keep the sandwiches, Roxy. I’d rather have you come inside and get something fresh to eat.” The now wealthy hotel owner watched a flash of panic cross her expressive face. She had no money. He knew that expression. His childhood had been marked with poverty. “As my guest, of course,” he added quickly. “Thank you, Mr. Herrera, but I’m unable to come inside today,” she politely said as she edged deeper into the dark sections of the alley. With a flash of a smile, she added, “Thank you, Jim.” She was gone before either man could stop her. Roxy will soon need Miguel Herrera's help - badly. Perhaps, he needs her help as well. 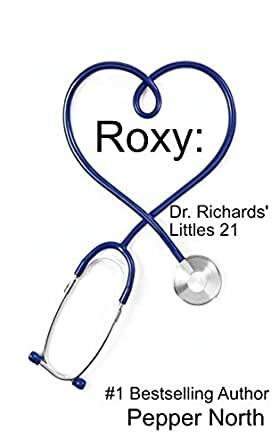 Some of the characters from the first twenty novels in the Dr. Richards' Littles series reappear to continue their stories. You do not need to read the stories in order. The books do not necessarily take place in chronological order. All are complete stories. The Dr. Richards' Little books will feature invasive medical treatments, including thorough examinations and enemas when required, as well as diaper changes, spankings, and other punishments. If you are offended by age play (adults who choose to live as a Little or a parent of a Little), or dubious consent, this is not the book for you. If this is your first "Dr. Richards' Littles" book, do yourself a huge favor and get #1 through #20. Each book details a loving age play relationship that will have you feeling good. I particularly enjoy the recurring characters in this series and that is one of the reasons that I recommend reading all the books. You never know when Zoey might pop up or when April needs to help a new Little. Jillian and Paul are in every book and they each have their own story as well. It's a wonderful community of supportive people that will be on your reread list for a long time. I have read all the Dr Richards Little books but this one was somewhat different. It had a stronger storyline which was greatly appreciated. I enjoy how the characters enhance each other. The HEA's are always welcomed. Thank you once again! I really enjoyed this book. I'm so happy that there are so many awesome books in this series and hope there are many more to come. I do wish they were longer though. I have read this series multiple times but Roxy just makes me smile. She embraces the Little world and makes it hers.